I had hoped to show a completed sweater and skirt today, but no sewing or knitting got done this weekend. Here are some pretty pictures instead. Yesterday, Iris and I drove to the Los Angeles Zoo for a behind the scenes tour. (I hope to post about that later.) Iris took this picture from the back seat of the car as I concentrated on driving. Aren't the snow-capped peaks behind the downtown skyscrapers pretty? Today, while Iris was visiting the Heritage Square Museum with a friend, Bad Dad and I enjoyed lunch and a walk on the pier in Manhattan Beach. Look at the choppy surf. We saw two tankers and a very large ship I can't identify. On the left is a tanker that has finished unloading and is departing. I can't figure out what the boat on the right is doing. Is that an empty container ship with nowhere to go? This tanker is docked at the offshore platform for unloading. You know the saying about steering a supertanker? (Make small adjustments, far in advance.) You really understand it when you see the supertankers slide next to the platform very very very slowly. When they are done and leaving, they go much faster. They also ride higher in the water when unladen. I read today's (24 Jan 2010) Doonesbury this morning in the Sunday comics section. I am only showing the last panel of it because I don't want to get in trouble for copyright infringement. You can look it up by day at the Doonesbury archive at gocomics.com. My first thought was, "Is she wearing the ruffles scarf from Scarf Style?" Because that is a really cool scarf and it's in my queue of stuff I would like to knit someday. My second thought was WTF? That cannot possibly be a cafeteria at MIT. But all eight panels, showing various figures walking in the background were guilty of the same thing. I showed it to MIT alum, Bad Dad. His first thought was, "Cool, MIT is in the comics!" "That character has been at MIT for years. Is there anything odd about the picture?" I asked. "Is this supposed to be present day MIT?" "Yup, and he's killed off all the Asians at MIT." I shouldn't have typecast. I expected better from Garry Trudeau because he appears to be a liberal. But I guess liberals are just as racist as anybody else. I lived in many places as a child, but spent more time in the San Francisco Bay Area than anywhere else. I consider that my hometown. When I moved from Berkeley to Boulder, I was homesick. When I heard about a new TV show set in SF called Party of Five, I tuned in to catch a glimpse of home. It was sickening. I was physically ill. It wasn't just incredulity that these financially-struggling orphans could be living in a multi-million dollar mansion in pricey Pacific Heights (with Danielle Steele for a neighbor). It was a classroom scene with 11-year old Claudia who supposedly attended a public school in SF. The camera panned across the classroom and all but one student was white. There was a token black kid in the back row of chairs*. We were wiped out of the picture. I told Bad Dad about the disturbing scene and the dearth of Asian characters in movies and TV overall. He said that, to be fair, a lot of movies are constrained in their casting by their genre. "How so? Which genres?" I asked. "Science fiction and things set in the future." "Are you saying that, in the future, a virus has wiped out all the Asian people on earth, over half the world's population, and it is never mentioned in the story lines?" In the original 1966 Star Trek TV series, there was Sulu. (OK, one character represented all the Asians on Earth, but at least he was there.) Fast forward to the four Star Trek series from 1987 to 2005 and all the Asians in the universe had died out with the exception of Sulu, who made a brief guest appearance. Other TV series purportedly set in SF were no better. Dharma and Greg, Suddenly Susan--all ethnically cleansed. A friend told me that televisions are not designed to bring entertainment to people's homes. It's designed to deliver eyeballs to advertisers. If TV shows are going to advocate ethnic cleansing, then they will have to do it without my eyeballs. I haven't watched network television (with the exception of the Simpsons) for the last 15 years. And now you know the secret to my knitting and sewing productivity and why I have time to read so many books (and blog)! I grew up in the burbs, but Eric attended public HS within the SF city limits. Would he care to state the ethnic breakdown of his senior class? * At around that time, I read in the newspaper that the public school population of SFUSD was about 80% Asian-American. The rest were mainly Latino and black. See the current demographics. Whites (second column) now make up 10% of the district overall and Asians represent about half. I wonder when we will see that on TV or in the movies? I won't hold my breath. See pictures of present day MIT when we attended Bad Dad's college reunion last year. I need to print a retraction/clarification about what Iris was emulating in the photo. She was not taking a swig as I had joked; she was emulating a park ranger who had shown her how to tear open a paper packet of gunpowder with her teeth and load a musket (and then fire the musket at redcoats). Or perhaps I should have called this post, "How to barter backyard fruit." I have a surfeit of Meyer lemons. I gave some to a coworker who gave me kumquats last year. This year, he gave another bag of kumquats to me (as well as periodic pictures of the ripening kumquats in his yard). There is a retired lady on my block with 4 mature avocado trees. There is no way she can possibly eat them all so I asked her if I could trade her some Meyer lemons for her avocados. She said yes, she could use three lemons. I went home to fetch her three. Upon my return, she handed me six avocados and told me I could come by later for more. Then I brought some to Dave's Olde Book Shop near my home because the lady who works there on Sundays (I forgot her name) is a fan of Meyer lemons. And why is she buying treats there for herself and her TKD instructor? Because he drives her from her elementary school over to the community center for class (while Bad Dad and I are at work). As some of you know, we lost the world's greatest nanny when she transferred to a 4-year university and moved away. We couldn't find a replacement that suited Iris. So Bad Dad and I were stuck taking time off from work to get her to TKD class. When I heard the principal of her school complain about a karate instructor's failure to return the principal's phone calls, I quickly asked him if he was willing to consider TKD instead. Score! Her TKD instructor teaches a beginner class at her school (with Iris as the teacher's aide), and then they grab a snack (Iris misses snack time at the afterschool daycare on these days) and head over to the community gym for the intermediate class. We pick Iris up at the gym on the way home from work. At first, I didn't know about the missed snack time. But then Iris let it slip that she went to McD's weekly. How can that be? Our family rarely goes to McD's, and then mostly on our road trips. Not only had her TKD teacher been driving Iris to class, but he'd been buying her snacks at the McD's next to the gym. I figure, with the money we are saving not paying for after school care and a nanny to schlep Iris around, the least we can do is pay for both of their snacks. And she loves being a teacher's aide. She says the little kids in the beginner class are so cute. Remember when she was one of the little kids? Oh, we got kohlrabi in our CSA box today. Don't they look like purple UFOs? If you see me in person, don't forget to ask me to tell you my hilarious UFO story. Here's the rest of the box. I posted about it at the CSA blog. It's not backyard fruit, but I also bring apple-persimmon cake to a coworker who brings me Hashiya persimmons from the Santa Monica farmer's market whenever he sees 'the persimmon lady'. I entered my 4 t-shirt skirt in the Pattern Review Refashion Contest. If you are a member of PatternReview.com, take a look at the contest gallery. If you should be moved to vote for my entry, vielen Dank! BTW, I know many people are in shock about what happened in MA yesterday. But, I noticed that none of the MSM outlets and talking heads (or at least none that I follow) say that she lost because she was a woman. Remember what they did to Pat Shroeder? There has been some progress. True winter strawberries (rather than those imported from a warmer clime) are a rare and precious commodity. They look pretty ordinary, but they are the most amazingly sweet strawberries we have ever tasted. When we took the Tanaka Farms CSA family day tour, Glenn Tanaka told us that the first crop of strawberries in the season are his favorite. They plant strawberries in October/November. By the end of December, the first strawberries ripen. Winter berries are the smallest and sweetest strawberries the plant will ever produce. They mature more slowly due to the cold weather and shorter days. There are only a few, not enough for commercial harvest. Glenn says he and the rest of the TF family love to walk the fields then, searching for strawberries under the leaves and eating them right away. By January, there are a bit more--enough to share with the CSA families. Last week, we received two pints of these ambrosial berries in our CSA box. In February-March, when the days get warmer and longer, the plants go into full-scale production. They can pick the plants every few days because the berries grow and ripen so quickly. They will also be bigger, but they will never be as sweet and precious as those early season jewels. Sadly, the heavy rains this week may damage the strawberry plants. They need just the right amount of rain and this may be too much. Mildew can set in on strawberry plants if there isn't sufficient sunshine and wind to dry the plants out between waterings. We hope for more winter strawberries in this week's box, but we are prepared to be disappointed. The ones from South America or greenhouses sold in the supermarkets are not the same. If you live in Beach Cities/ES/Torrance and want to order Tanaka Farms CSA boxes, visit the Madison and Lincoln School CSA blog for signup information. 5th graders in California study the weather. Not surprisingly, my 5th grade daughter and I have been talking about the weather on our walk to school in the mornings. Last week, we discussed the difference between latent and sensible heat and how the increase of surface level moisture can mask the temperature signal of global warming. In the mean time, I want to better explain why meteorologists are so certain that Los Angeles will be hit by a series of heavy rainstorms for much of the week of Jan 18. I could have said something about really complex computer models running on really humongous supercomputers. But, in 5th grade, I will be happy if she understands some of the underlying physics. 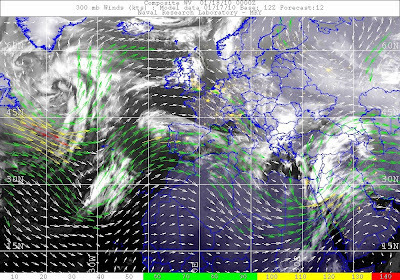 Take a look at some satellite imagery overlaid upon a jet stream analysis. See how the cloudy and stormy areas line up along the wind streamlines? The cloudiest areas tend to be near the areas with the fastest jet stream winds. This figure comes form the Naval Research Lab with the Navy's jet stream analysis. Check out the jet stream forecast for tomorrow afternoon. [00Z or 00 UTC on 19 January is 4 PM 18 January because PST = UTC-8. Click here for the time and date conversion.] This figure comes from the California Regional Weather Server and is produced from NCEP data. See how the jet stream will dip south and then turn northeast to hit the California coast near LA? That weather pattern brings much more rainfall than the storms that come directly from the northwest because the air mass travels over the ocean first, picking up moisture. Just remember that, when the jet stream moves southward towards southern California, the storm gate is open. When that happens, the sea surface temperature (SST) becomes crucial. The warmer the offshore water, the more moisture the air picks up before slamming into our coastal mountains. As the air is forced upward, the air cools and the moisture falls out of the air--a process we call rain. So what does the SST look like? NOAA and the Navy produce global analysis charts of SSTs, but it is sometimes more helpful to look at the SST anomaly, the difference between the current temperature and the climatological mean for this time of the year. This figure comes from the Navy website in the link above. Right now, the SSTs offshore from SoCal are warmer than average. The jet stream analysis shows us that the stormy weather is going to blow to the south of us and then swing around to hit the coast. The storm is going to travel over warmer than typical coastal water, picking up more moisture than a typical storm. I already explained above why there is a tendency for the jet stream to be stationary. The global weather models confirm that the jet stream will park over us for at least a week, opening the storm gate. Furthermore, the air will pass over warmer than typical water before it hits us. This points to a very wet and dangerous week in Los Angeles. It's time to fill more sand bags! Clarification: Warm water doesn't necessarily bring rain. That's why some El Nino years are not exceptionally wet years. The air flow has to also pass over the warm water for us to get large amounts of rain. Drought-busting (and flood-producing) rains require both the right jet stream pattern and warm off-shore water. Our departmental secretary is expecting a baby boy in March. His initials are embedded in pattern. It's a bit puckered, and I dithered about whether I should redo it for her. But, when I told our secretary about the puckering, she told me very emphatically NOT to try to 'correct' Iris' sewing. She said that, if it fell apart at the seams a bit, she would hand stitch it back together. Speaking of hand stitching seams together, here's my first quilt. It needed a little repairing after washing, too. There are some tucks, but no "toe-catchers". The boy, Taylor Pugh, says he likes his hair long and curly. But on Monday night, the school board in Mesquite voted unanimously to enforce its ban on Beatles haircuts, much less anything approaching coiffures of bands like Led Zeppelin. School officials say the district’s dress code serves to limit distractions in the classroom. No exception could be made for the pint-size rebel, who sat through the hearing with his hair in a ponytail, manifestly bored. Is the district asserting that long hair prevents learning? Are the girls in the school district subject to the same grooming rules? If not, could their long locks* be responsible for a gender learning gap? Is the school district more interested in education or indoctrination? Do the school board members know the difference? You can sometimes see the full science books online at the publisher's websites. For elementary grades, no password is usually required. * International readers may not be aware of regional differences in hairstyles in the US. There is a vast social chasm between big-haired women and pointy-headed elites. And there is another gulf between merely big hair (a la New Jersey) and what we call "Texas-sized" hair. I bought the Alabama Stitch Book when it first came out. I can't justify buying the follow-up book, until I actually make something out of the first book. I understand what Natalie Chanin says about fully handmade goods and sewing love and intention into every stitch. But, realistically, I have arthritis and limited free time. I decided to machine stitch my version. Here's one of the four t-shirts from Goodwill that gave their lives to make the skirt. 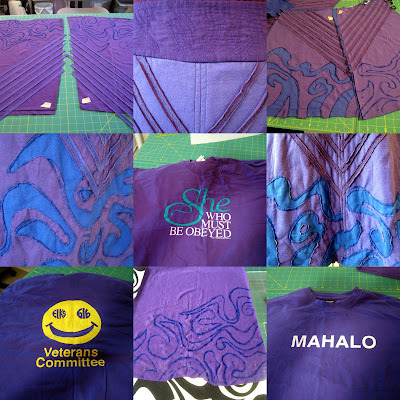 If purple isn't enough to make you smile, then mahalo surely will. So good intentions are integral to the skirt. The book suggested using buttonhole twist, a very thick thread. I didn't have any in blue, so I used two strands of blue thread with a large-eye topstitch needle. I used a third color of blue in the bobbin. This project used up several leftover spools of blue thread. There's still plenty more left. The book comes with a 4-panel pull-on skirt pattern. The front and back are the same. Their skirt is slung low on the hips and is held up with elastic. It's not even flattering on the tall and skinny models in the book. I decided to use a skirt pattern that I know fits my body well. I began with the skirt from Vogue 7607 that I used for Unsuitable for plaids or stripes. I traced out half the front and back panels and added center seams to make a yoked, 4-panel skirt. The length of a skirt made out of old t-shirts is limited by the length down the center front of a shirt. A yoked skirt helps eke out a little extra length. My skirt is 26" from waist to hem. The instructions in the book used stencils and an airbrush with textile ink to transfer the applique design to the t-shirt jersey. I had textile paint, but lacked an airbrush. I tried to make my own stencil, but cutting a stencil for a one-off project was too daunting. Then I made a light box from an under-counter fluorescent light fixture and a clear acrylic quilting table that fits around the free arm of a sewing machine. I bought a half yard of home dec fabric with the kind of flowing abstract pattern I had in mind. Then I discovered that the pattern isn't really suitable for a stencil anyway because it has closed areas inside of closed areas. So I simplified the pattern as I traced. Eventually, I ended up painting a design freehand instead of tracing the pattern. Draw my main stripe lines, making sure they match at the seams. Paint on the designs in the area not covered by the stripes. (Note how there are extra paint lines in there amid the stripes?). Construct the skirt in the normal manner. To reduce the bulk at the seams, I pressed the seams open, serged each seam allowance, and then topstitched 1/4" on each side of the seams. I'd probably wear it like this, with boots or sandals, depending upon the weather. Yup, I own an alarming number of Eileen Fisher pieces. It's a good thing Bad Dad doesn't know how much they cost. This skirt was made entirely out of stuff I already had crammed into my sewing room. I really need to use and enjoy more of my stuff. so there is room in there to move around and see all the awesome stuff I have lovingly collected over the years. I made a Flickr slide show of my Vogue 7607 skirts and posted a pattern review for the project. Is the credit crunch easing? Because my 9 year old received a credit card solicitation in yesterday's mail. The credit crunch must be over because she received another credit card solicitation today. Sent to a nine year old. The only thing harder than photographing kids is photographing them together. I finally got a decent picture of the two cousins together with their matching pink leopard hoodies* (Kwik Sew 2893). You can just barely see the new flowered pants. Her mom says that it is so difficult to get her to wear pants and they live in northern northern California, where it actually does get below freezing. For her holiday present, I let her pick out fabrics from my fabric closet. She chose no fewer than four fabrics. I store my frequently used patterns in a binder with construction notes. I can see that I last made the Kwik Sew toddler pants for her in November 2008, also using toddler size 4. But this time, I had to add 2" of length. Happy new year. I celebrated by coming down with a cold. My head is stuffy and foggy so my apologies if this post is incoherent. * Not to rub it in or anything, but the girls tore off their hoodies right after the photo shoot. It was just too hot at the beach to keep them on--upper 70s and sunny with a light breeze. Eric and his family are blogging from Bangalore/Bengaluru. Click here to read his daughters' first thoughts about the difference between Colorado and their new temporary home. So far, Sophia has determined, based upon her placement exam, that science is taught more rigorously at a younger age there. Eliza has noticed that people travel with less excess baggage than in the US. That is, they don't carry a 4000 pound car to carry a single human around. They use motorcycles. There are more observations about differences in energy use. I hope you visit them in in their new home, Bangalore Sabbatical.